He defended Trump, criticized the liberal media, and referred to his MAGA hat as a "Superman cape"
Kanye West — or is it YE? — performed last night on the season premiere of Saturday Night Live. He played music, of course, but he also ruffled plenty of feathers by delivering an off-air political speech wearing his infamous MAGA hat. Kanye ended the show by performing the ye cut "Ghost Town" alongside guests Kid Cudi and 070 Shake. He wore his MAGA hat, and he pointed to the hat's slogan when delivering the line "this ain't what they had in mind." The song was cut off for time, but for those in the studio audience, Kanye kept going. Still wearing his MAGA hat, he criticized the Democratic party and claimed, "You know it's like the plan they did, to take the fathers out the home and promote welfare… Does anybody know about that? That's a Democratic plan." From there, he went on to talk about Trump and said, "There's so many times I talk to, like, a white person about this and they say, 'How can you like Trump? He's racist.' Well, uh, if I was concerned about racism, I would have moved out of America a long time ago." 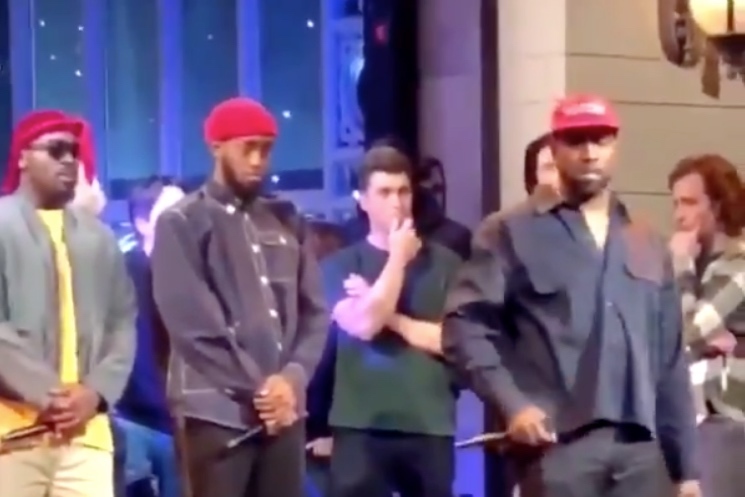 Kanye claimed that he was bullied backstage at SNL and told not to wear his MAGA hat. He then pointed at the hat and said, "I'm gonna put my Superman cape on, 'cause this means you can't tell me what to do. Follow your heart and stop following your mind. That's how we're controlled." He also criticized the media for its liberal bias. The words were received with a mixed reaction to say the very least, with some very scattered clapping, a few boos and shouts, and mostly a lot of awkward silence. In the video, you can see the SNL cast members awkwardly stand around looking at their feet, and Chris Rock — who filmed the speech for his Instagram story — can be heard snickering and whispering, "Oh my god." Watch various videos of the speech below (including Rock's Instagram stories), plus the performance of "Ghost Town." Elsewhere on the show, West performed "I Love It" with Lil Pump (who evidently isn't in jail) and the unreleased "We Got Love" with Teyana Taylor. Despite promises that his album Yandhi would be released yesterday to coincide with SNL, the album still isn't out as of press time.